Three of my four grandparents were Irish Catholics. In that tradition, given names for children generally come from a pool of approved saint names. The number of variations offer a sense of choice, but whether you choose Kathleen, Cathleen, Katheryn, Kathryn, Katharyn, Katherin, Catharine, Cathryn, Katheryne, Katharine, Katharina, Katrin, Kare, Karina, Kathrin, even Caitlin, – it’s the same, blessed Saint Catherine. While all girls’ names are lovely and all boys’ names are distinguished, Catholic names, generation after generation, after generation – become monotonous. For novelty, I turn to my Nana, who was Edna Mae Keirstead (1898-1988). Her Protestant pedigree stretches back to New Amsterdam (modern New York City), and delightfully different names begins with her father, Levi Springer Keirstead (1858-1921). Exotic appellations of his forebears include – Abiathar, Adoniram, Amenzie, Elias, Hezekiah, Isaiah, Ebenezer, Elnathan, Jedidiah, Obadiah, Zachariah and Zebulon. Isn’t it fun to wrap your tongue around those multisyllabic gems? The Old Testament was a strong influence because properly devout Protestants read the Bible. Even hardscrabble, rural families (such as most of my folks) usually included at least one adult who was literate (and who taught the youngsters). If a poor household possessed a single volume, it was the Good Book. In addition to spiritual guidance, the Bible supplied history, genealogy, and thrilling stories with vivid characters. The Bible was a thwacking good read for long dark winters in the boonies. Another naming convention, made trendy by Puritans, was the choosing of a virtue, a child could aspire to on the way to adulthood. Both boys and girls among New England folks were called – Constant, Content, Charity, Deliverance, Experience, Patience, Prudence, Remember, Waitstill, Hopestill and Love. Of these, Charity and Hope (from Hopestill) and others like Faith are still used today. In an earlier blog post, I mentioned my gratitude for the tradition of giving the mother’s family name as the child’s middle name, a practice predominant among Protestant lines. An example from my tree is James Ganong Keirstead (1835-1926), the son of William and Elizabeth (Ganong) Keirstead, but there are so many, I’ve been able to tie a great number of married daughters back to their parents. Sometimes, the mother’s maiden name becomes her child’s first name. For example, among my Freetown, Massachusetts relatives, Samuel Hathaway and Mary Evans, named a first son Samuel (b. 1781), for the proud papa, and a second son was Evans Hathaway (b. 1783), for the proud mama. Crocker Babbitt (1788-1861) of Dighton, Massachusetts is another example – with a twist. Crocker was not the mother’s birth name, but the maiden name of the grandmother, Bathsheba (Crocker) Tobey. In contrast, wives’ and mothers’ origins for my poor Irish Catholic lines get lost one step past the immigrants. Though, not my family, it’s worth noting here there’s a prominent exception to this disappearing woman rule in US history . Our nation’s 35th president was John Fitzgerald Kennedy, son of Joseph P. and Rose (Fitzgerald) Kennedy.. Among my Canada-born great-grandfather’s brothers, is a Wellington. That name clearly inspired by the hero who defeated Napoleon at Waterloo and later became a statesman. While Wellington is legendary, how many know that he was born, Arthur Wellesley (1769-1852)? His title was the 1st Duke of Wellington. My ignorance of Canadian history blinded me to the origin of other names in genealogies north of the border. A 4th great-great uncle, Thomas Carleton Ganong (1785-1856), was named for Thomas Carleton, Lieutenant-Governor of New Brunswick, or maybe, just Carleton for Tom’s brother, Sir Guy Carleton, Governor General of British North America. Maybe, it was for them both. Chipman is attached to a number of individuals with different surnames. Since Ward Chipman (1754-1824) was instrumental in establishing the province of New Brunswick, their birthplace, he may have been the inspiration. Then, there were other Chipmans in public life. My southeastern Massachusetts patriot families, like many of that period, named children for founding fathers. I’ve found a George Washington Chase (b. 1808), son of Benjamin & Lydia (Shove) Chase, and Benjamin Franklin Babbitt (b. 1805), son of Benjamin & Serena (Burt) Babbitt. As a science enthusiast, I was also pleased to discover an Isaac Newton Babbitt (1830-1901). I was lucky to find a smoking gun for Basil. In more cases, the rationale for any past person’s action remains frustratingly unfathomable. How does Malbone strike you? That given name comes from my endlessly interesting Hathaways of Freetown (MA). When I first picked up Malbone, the old school Latin kicked in; mal- means bad or evil, so this old man was, literally, bad to the bone. To my deep disappointment, I must report that I found no evidence that Malbone Hathaway (1774-1861) was ever even grumpy in the morning. Rather, Malbone was hometown boy who took a wife, raised a passel of kids, worked the land, and was laid to rest at the ripe old age of 87. His name mustn’t have troubled him, either, for he gave the world a Malbone junior, who also lived his life as a regular guy. Perhaps, Malbone’s brother, Wanton Hathaway (1776-1855), had a worse name. Merriam-Webster gives as synonyms for the word wanton (as an adverb), – lewd, bawdy, merciless, inhumane, malicious and extravagant; a wanton (as a noun) is – one given to self-indulgent flirtation or trifling or a pampered person or animal. You get the idea that being called wanton is not a compliment. Wanton, the man, however, seems not to have been at all wicked. The best I can do with Wanton is to unfairly judge his life by modern standards, which makes him only – wicked boring. The parents who named Wanton and Malbone also had interesting names. Their mother was Dorcas Wrightington (1743-1814), Dorcas being a Christian woman of New Testament times who made clothing for the poor. Their father was Clothier Hathaway (1739-1789), a clothier being a person or business that makes or sells clothing. — Surely, that was a match made in heaven. Readers, please feel free to share your own tales of interesting family names and namesakes in the “Comments” section. Cousins and others with questions about featured individuals or families in my tree, can email genealogy@christineroane.com & I’ll be happy to provide my source material. Wikipedia is handy for a quick look-up of nearly any unfamiliar person, place or thing. I referenced wiki articles for John F. Kennedy, Wellington, Thomas and Guy Carleton. Baby names will make future family historians scratch their heads, too. Why? 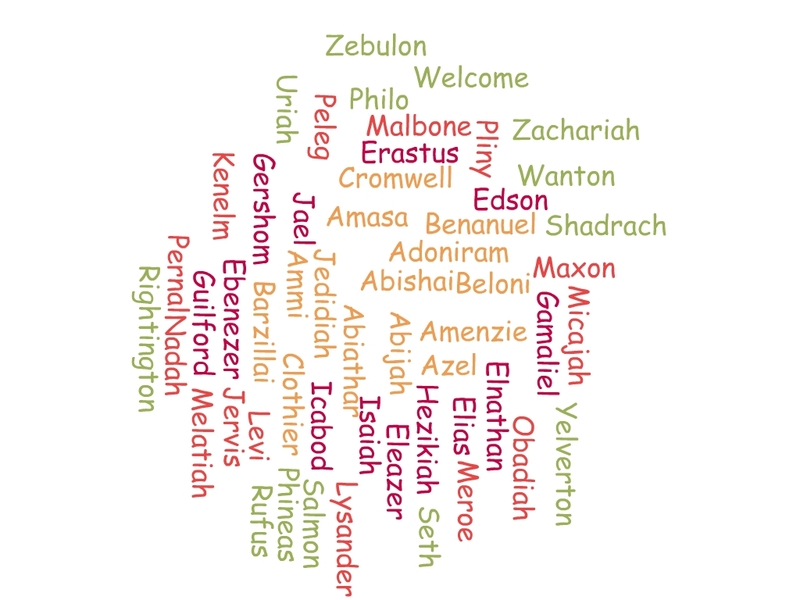 Click over to Cool Name Lists for today’s expectant parents for suggestions that reference Shakespeare, US Presidents, Hunger Games and Dr. Who. Ben Affleck’s initial concealment of a slaveholding ancestor for his episode of Finding Your Roots with Henry Louis Gates, Jr. makes it time for me to come clean. I too, have slaveholders in the family, and these ancestors shame me more than the murderers and other miscreants I’ve been featuring on this blog. I’ve had a document with this post’s title filed away for years. Sure, it was a rambling, bumbling, stumbling mess, not ready for primetime, but I kept ignoring it. Any subject would do if I could push off a confrontation with my sense of guilt over slavery. When I was a greener researcher, with roots in New Amsterdam / New York and New England, the northern states, I believed my family was in the clear on slavery. In retrospect, my ignorance on slavery in the north was stunning. 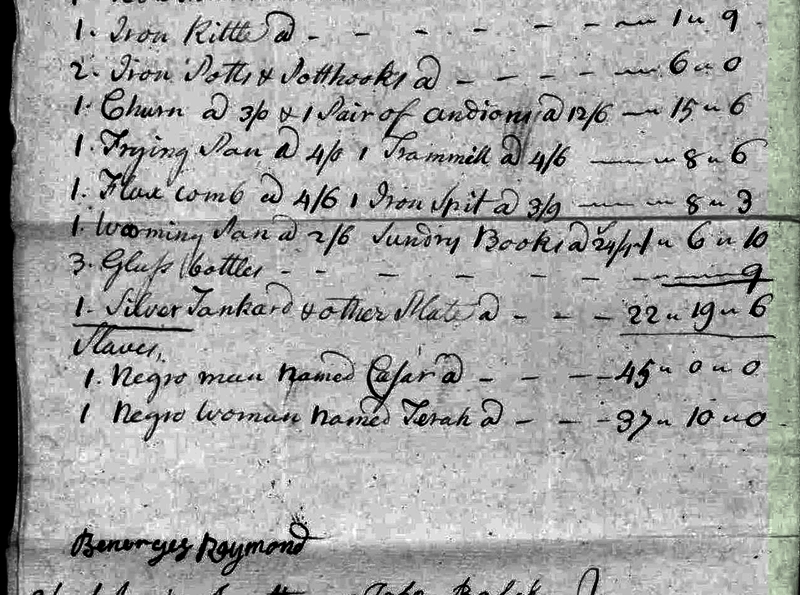 My personal wakeup call came in the will of my 8th great-grandmother, the Amsterdam-born pioneer settler of New York, Sarah (Roelfse) (Kierstede) (Van Borsum) Stoothoff (1626-1693). It’s sobering to learn your people committed crimes against humanity, while regarding themselves as good Christians and respectable members of society. Several celebrity descendants of slaveholders have been featured on Finding Your Roots and Who Do You Think You Are, including Anderson Cooper, Ken Burns, and Bill Paxton. They did the right thing right off by facing the findings on camera. They shared their disappointment and righteous anger. They acknowledged we all must accept the bad guys along with the good guys in our trees. And so it should be with our great, multiethnic, multiracial, American family. Many folks argue that United States “fixed” slavery 150 years ago; that civil rights laws in the 1960s “fixed” segregation and discrimination; that white and black Americans have an equal shot at life, liberty and the pursuit of happiness. Yet, if that was true, if that was the present reality, – nice, white Americans, like Ben Affleck, wouldn’t be so troubled over errant great-greats. The terrible disparity in income, health and life spans between whites and minorities is evidence that our nation hasn’t yet established a culture that supports the American ideal of equality. We can’t change the past, we can, and should, look it straight in the eye. Instead of dithering over guilt, we can join with nice Americans of all races to build toward a society that truly guarantees an opportunity for a decent life to all. It won’t be easy, but working to “form a more perfect union”(4) is as good an idea today as it was in 1787. (1) Abstract of wills on file in the Surrogates Office, City of New York (Volume I. 1665-1707) by New York (County) Surrogate’s Court Abstracts of Wills –Liber 5-6 pgs. 225, 226, 227. (2) Sarah learned native languages and assisted Peter Stuyvesant in negotiating treaties with local tribes. In 1682, she was confirmed as owner of a patent originally granted to her second husband, Cornelis Van Borsum (1630-1682) for a lot on Manhattan Island, for her service. She also raised 11 children and outlived 3 husbands. (3) Essex Registry of Deeds, Book 16, Folio 204, March 12, 1705. Slavery in the North Website by historian, author, journalist and lecturer, Douglas Harper. History of Slavery in Massachusetts Wikipedia article covers freedom suits brought in 1781 that claimed slavery was contrary to the Bible and the new (1780) Massachusetts Constitution, but slavery remained legal in Massachusetts until the 13th Amendment was passed in 1865. I’m thankful for a sprinkling of heretics (or as they are politely called today, – Protestants) that add color to an otherwise monotonous Roman Catholic background. I owe the debt to my paternal grandfather, James Patrick Henry Roane, Senior who, in 1921, married a devout Baptist, Edna Mae Keirstead. Nana’s line includes clergymen, even saintly men, who suffered for their faith, among them, the Reverend Obadiah Holmes, an ancestor of Abraham Lincoln. At the other end of the spectrum, is my ninth great-grandfather, George Barlow. His claim to fame is that he made people suffer for their beliefs, and worse, – he enjoyed it. Barlow made his mark decades after the Mayflower Pilgrims established their little commonwealth in Plymouth. As that colony’s population multiplied, the founders’ ideals gave way to a new generation’s lust, — the lust for land. Families spread out and new settlements sprang up. By 1640, another 20,000 English settlers had come to New England. The most notable arrivals disembarked further up the coast in 1630. They were another group of reformers, the Puritans. While the Pilgrims were religious refugees, chased from England to the Netherlands, the Puritans voluntarily left an England they found too tolerant. Backed by investors expecting a good return from Massachusetts Bay, the industrious Puritans did not disappoint. The industrious newcomers rapidly established Boston as the political, commercial, financial, educational and religious center of New England. 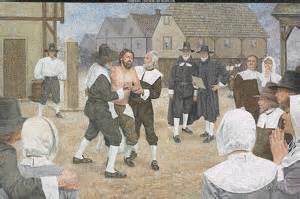 Granted authority they were denied in England (and blind to historical irony), the Puritans introduced religious persecution to the New World. –	Quakers engage in nonviolent protests against militarism and environmental destruction. So how could the Puritans, fellow Christians, treat these peaceful souls so barbarously? Well, it turns out that present day Quakers have changed considerably since the 17th century. Shiny new Quakers were fervent believers, like new converts in any century. Among the early leaders were zealous evangelicals determined to sow god’s latest message in New World soil. But it wasn’t simple religious heresy that enraged the Puritans, – Quaker ideas threatened the social order. Quakers believe that each human being is born with “inner light,” and therefore, all men and women are created equal. At meetings, anyone might be moved to share a divine insight, and they did not have a paid clergy class. Quakers addressed others as “friend,” – whether rich or poor, black or white, titled or commoner. Furthermore, owing allegiance only to god, Quakers refused to swear oaths to civil authorities. –	Quakers burst into churches, interrupting Sunday worship, and provoking arguments with clergymen in front of their congregations. So while these offenses will never justify the atrocities the Puritans committed against Quakers (and other dissenters), they add a dimension that helps us understand (a little) how it happened. And it was under these circumstances, in 1658, that the General Court of Massachusetts awarded drunkard and bully, George Barlow, his dream job. In Part 2 in which I’ll fill you in on my ignoble ancestor’s reign of terror on colonial Cape Cod! The title quote comes from The American Genealogist; Vol. XXVI, No. 4; October, 1950; Barclay, Mrs. John E.; Ann (Besse) Hallet, Step-Mother of Abigail (Hallet) Alden. Persecution of Quakers in Colonial New England, Excerpt from The Beginnings of New England by John Fiske, 1892; edited by Dainial MacAdhaimh, 2005. With the current events focus on the US government charging whistleblowers, journalists and other leakers of embarrassing information with “aiding the enemy,” and threatening dire consequences, I thought it timely to mention my family tie to a man who was executed for treason. I had a cousin in colonial New York named Elsje Tymens. She was a wealthy widow in 1663 when she married a German bachelor and son of a clergyman, Jacob Leisler. Over the next thirteen years, Jacob and Elsje built connections in business and government, accrued wealth, and added seven little Leislers to the household. Jacob was a merchant, captain of the militia, and appointed by the courts to administer estates and other property matters. A devout follower of John Calvin’s brand of religious reform, he identified with the (French Protestant) Huguenot community. Across the Atlantic, political factions were so alarmed by King James’s policy of religious tolerance and his ties to France, that they invited William III, the Dutch Prince of Orange, to invade with his fleet (and his English wife, Mary). James was deposed in a coup known as the Glorious Revolution. When the news reached American shores, it sparked a popular uprising against Governor Andros in Massachusetts, and New York’s militia rebelled and forced Nicholson to yield Fort James, which controlled New York Harbor. The next day, a council of militia officers asked Jacob Leisler to take command. A few weeks later, a delegation from Lower New York and East Jersey chose Leisler as the province’s commander-in-chief, to act on behalf of England’s new monarchs, William and Mary, until a new governor was legitimately appointed. Not all New Yorkers were pleased. In his rise to prominence, Jacob Leisler had made enemies that included his in-laws, the powerful Bayards and Van Cortlandts. Diplomacy was not his strong suit. An anti-Leisler faction coalesced in Albany, and grew dangerously. In late 1690, William III commissioned Colonel Henry Sloughter as his new governor, but Sloughter’s ship was delayed and his lieutenant governor, Ingoldesby, arrived first. Ingoldesby demanded Leisler turn over the fort and governmental reins to him, but, because he lacked the proper papers, Leisler refused. Even when Sloughter made it to New York, Leisler remained suspicious, and took his sweet time before he surrendered and to his cost. Leisler’s reward for accepting the management and defense of New York in the name of King William III, – was his arrest on charges of treason. Jacob Leisler, his right hand man and son-in-law, Jacob Milbourne, and eight other men were tortured, tried, convicted, and condemned to be “hanged, drawn and quartered, and their estates confiscated.” The panel of judges was stacked with a significant number of anti-Leislerians. Governor Sloughter seems to have had some misgivings about the result, as he wrote a letter to King William about the matter. However, in it, he trashed Leisler, did not include trial transcripts, and failed to mention the death sentence. Also, the court refused the request to send the condemned to England for an appeal. It’s been written that Governor Sloughter was bribed, that he was drunk, – perhaps, he was both when, at the instigation of Leisler’s enemies, he signed the death warrants. Leisler’s only ‘luck’ is that he avoided being drawn and quartered, was “merely hanged til ‘halfe dead’ then beheaded” as was his son-in-law, Jacob Milbourne, on May 16, 1691. None of the others convicted were executed. Petitioners to London who included the younger Jacob Leisler, won a hearing before the king. Within a year of their execution, Leisler, Milbourne, and the remaining prisoners were pardoned. Parliament later passed a bill that would return the property stripped from Leisler’s heirs, and which was approved by the king in 1695. But it was 1698 before the family estate was restored, and the bodies of Leisler and Milbourne were moved from the dirt beneath the gallows and laid to rest in the yard of the Dutch Reform Church. Scholars today recognize Leisler’s Rebellion as a precursor to the American Revolution. It was a power struggle of middling folks against an entrenched elite, – not treason. That’s something to think about as we Americans celebrate the 237 anniversary of our national ‘treason,’ – independence from England. Wishing all my readers a wonderful Fourth of July! McCormick, Charles H (1989). Leisler’s Rebellion. Outstanding Studies in Early American History. New York: Garland. ISBN 0-8240-6190-X.p.357. Voorhees, David William, Remembering Jacob Leisler, The New York Genealogical and Biographical Newsletter, (New York: The New York Genealogical and Biographical Society, Spring/Summer 2002), p. 29. Levi Keirstead, Family and Friends? Circa 1900, perhaps, in Littleton or Groton Massachusetts. My great grandfather, Levi Keirstead, sits on the porch rail, – hatless, in work boots, and with bushy mustache and arms crossed over his vest. Most of the others dressed up for the occasion, but what sort of gathering was it? If anyone recognizes Keirstead (or other) relatives, the house, or anything else, please get in touch! © Christine M. Roane | Contact genealogy@cool-universe.com for permission to reuse original content. However, you may use short excerpts and links that give clear credit to Christine M. Roane and the blog, Poor Irish & Pilgrims.